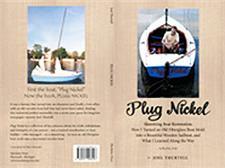 This book, written by David Buckman, is about making do and discovering the wild New England and Fundy Coast in a $400 yacht. 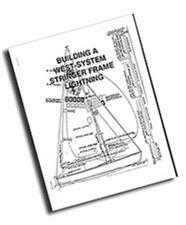 Mark Patty shares detailed instructions and diagrams about constructing a Lightning using stringer frame construction, skin of plywood & West system epoxy. 43 pages. 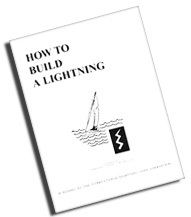 This book is intended as a detailed guide to the amateur builder for the construction of a wooden Lightning. 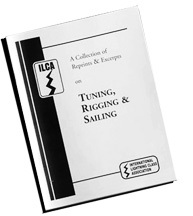 This book offers a compilation of articles from ILCA Yearbooks and Flashes; it provides pertinent information by and for Lightning sailors. 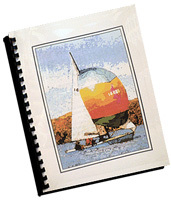 This book, written by Joel Thurtell, explains how he turned an old fiberglass boat mold into a beautiful wooden sailboat and what he learned along the way. This manual of twenty articles was compiled for the Juniors who competed in the Sears Cup. 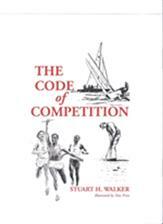 This book, written by Stuart Walker, examines the code of competition. 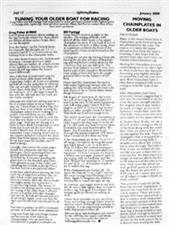 Greg Fisher, Bill Fastiggi, and Dave Nickels discuss the issue of chain plate placement on older boats and the decision to move or not move and tuning adjustments if you decide to leave them as is. This booklet was first published in 1971. 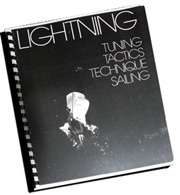 It has many of the articles reprinted in "Lightning – Tuning, Tactics and Racing Technique" plus additional articles.